I know it may seem like I’ve disappeared. But really I’m here. 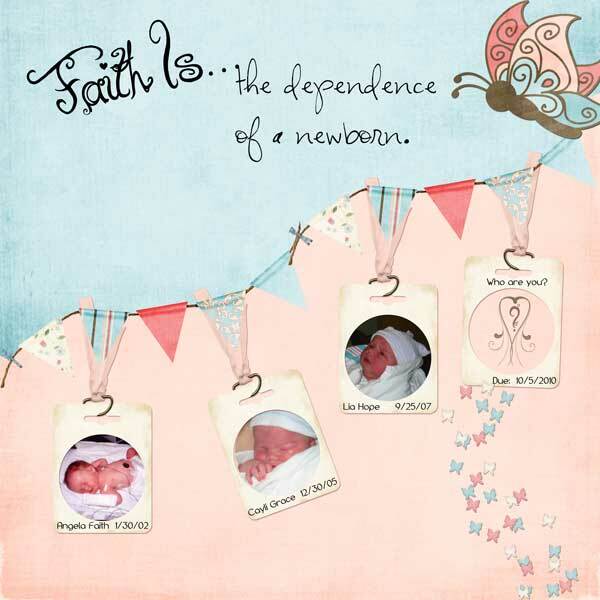 I actually have gotten some scrapbooking done, not only with Sweet Tomato’s Designs latest kit (more on that in a sec) but with some other kits because the topic spoke to me and would not let me go. Well hubby has a job for the Fall Semester. It is only an adjunct position, which although is a great resume builder will create it’s own set of challenges. More on that if your really interested on our personal family blog here. 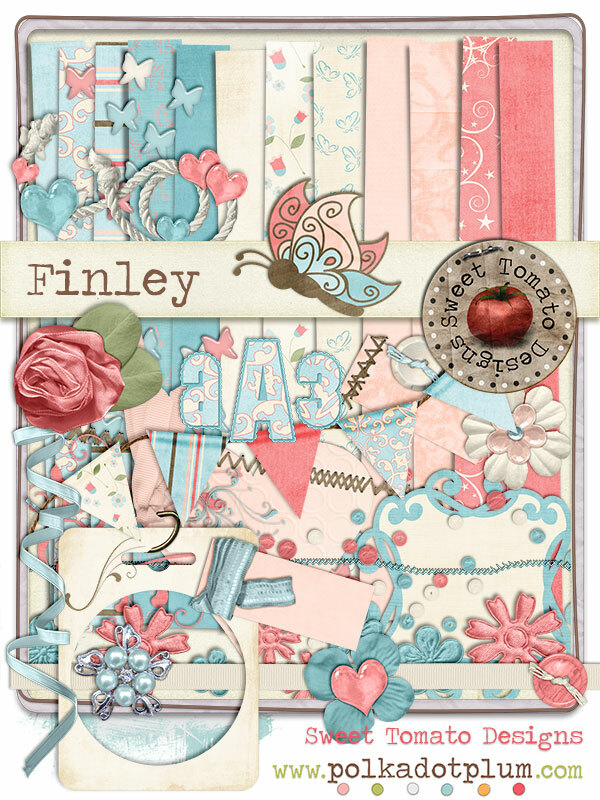 Sweet Tomato Designs has a new kit out called Finely in honor of Cara’s daughter. It’s one of my first pages that will have something representing all four (yikes) of our kids. I love the colors in this kit and I apologize for not getting the notification out about this sooner. Anyways… I loved playing with the pendant banners, trying some fancier Photoshop techniques (okay not fancy for some but for me they are) to split the papers along the pendant banner. And I think the butterflies leading up to the frame for the new baby just add that perfect touch. 🙂 I hope you enjoy it! The companion to this kit Nolan, is coming out next week. And it looks like I might actually have this layout ready in time. I’m combining a template set from Sweet Tomato Designs (newly released) with this kit so I hope you’ll enjoy it. Check back after the 21st to see the result, and of course where to buy the templates and the kit! I have lots of blogs that I read or subscribe to with my Google Reader. Actually I use iGoogle to look at everything because for some reason it seems less overwhelming that way, and it’s prettier. 🙂 So in that lately my motherhood section is what I have set to come up first. I’m nesting like I never have before. (At least in my memory.) I think it is all related to the uncertainty of what is coming in the next few months and how we are going to handle each aspect. I am a planner when I get like this and have had to complete things like our Baby Needs List in order to be able to focus on anything else. So things like my previous post of I Can Do This have started appearing in my scrapbooking. I’ve also been looking at our nursery and how we wanted to decorate it long, long ago. 8 1/2 years ago as we were preparing for our first baby girl, we painted her room on New Year’s Eve. Yes, you read that right. In Northern NY with the windows open (low VOC paint was not a big thing then up here) we painted the room blue. Unfortunately that was as far as it got. Other than the aquarium being added. And that is still where it stands. For a while we didn’t want to put pictures up and holes in the wall (stucco walls) but since we are going to be here for a while longer I think they are going up. 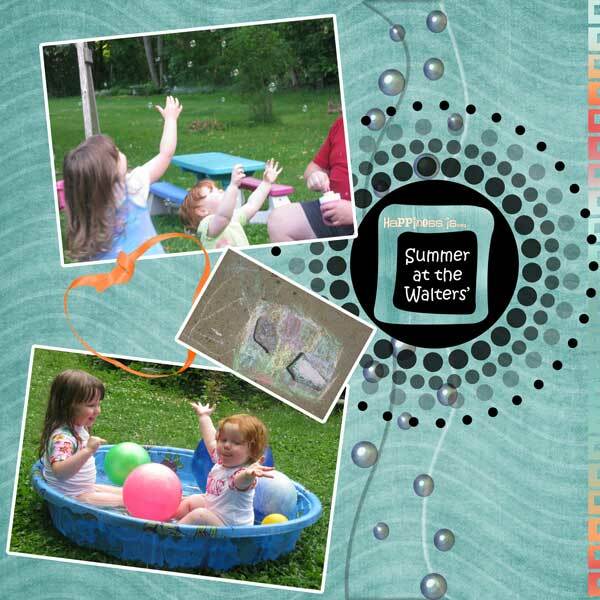 One of the first kits that drew me to digital scrapbooking was Octopus’s Garden. Partially because of our under the water/aquarium theme. I love this page that I created for a challenge at JessicaSprague.com. Even though this is not exactly an aquarium theme picture, I think I’m going to put a frame up in the baby’s room where I can put pages like this (as soon as I can get them printed) just for variety to look at. Otherwise we have puzzles that have been graciously put together by family members and framed. Lord knows I don’t have the time or space to put them together with two kids, little space and three cats who love to play with puzzle pieces! So yeah, I’m still here. We are still trying to figure out the logistics of what is to come. 80 short days until baby’s due date. It is unfortunately staying hot here in Northern NY and humid so it makes things being interesting being this pregnant. Air conditioners are running, and we are moving some things around which seem to be making it easier to get things done and so I do not feel like I’m ignoring my two girls and they do not feel like they are being ignored. Previous Post I CAN do this….